Welcome to bookkeeping-essentials.com website policies. This page explains how I conduct business on the internet. ... So please read the terms carefully. At Bookkeeping-Essentials.com we are dedicated to protecting your data and privacy. We recognize that your privacy is important. 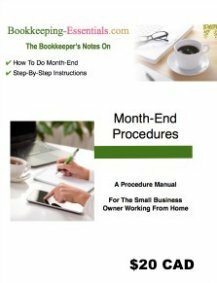 This document outlines the types of personal information we receive and collect when you use Bookkeeping-Essentials.com as well as some of the steps we take to safeguard information. We hope this will help you make an informed decision about sharing personal information with us. Bookkeeping-Essentials.com strives to maintain the highest standards of decency, fairness and integrity in all our operations. Likewise, we are dedicated to protecting our customers', consumers' and online visitors' privacy on our website. Bookkeeping-Essentials.com uses information from Google Analytics to track the number of visits to the website, browsers and operating systems. No personally identifiable information is obtained from these cookies. We use the information that Google Analytics generates relating to our website to create reports about the use of the site. These reports allow us to update the site and improve your usage of it. If you do not wish your data to be collected via Google Analytics, you can install its opt-out browser extension or add-on ... https://tools.google.com/dlpage/gaoptout/. We have set Google Adsense ads default to non-personalized for EU visitors. You will see dotted or double underlined links on this site. These links are part of a pay per click advertising program called Infolinks. Infolinks is an In Text advertising service; they take my text and create links within it. If you hover your mouse over these double underlined links, you will see a small dialog box containing an advertisement related to the text. You can choose to move the mouse away and go on with your browsing, or to click on the box and visit the relevant ad. You can learn more about Infolinks Double Underline Link Ads at www.infolinks.com. Each time you click on an Infolinks In-Text ad, you are directed to the advertiser’s landing page and I earn advertising revenue; otherwise, when the mouse is moved away from the hyperlink, the bubble disappears. I am currently trying to phase out this type of advertising but as it is a large site, I may not have found all the pages that have Infolinks content yet. We receive an affiliate commission for some of the products/services recommended on Bookkeeping-Essentials.com. The affiliate services platforms we use are eJunkie, Digiresults, ShareASale, DocumentSnap.com, and Sitesell.com. How Do I Offer All This Information To You For Free? As this site accepts affiliate and other forms of compensation, such compensation does not influence the information in this site. I always give my honest opinion, findings, or experience. It may occur that you do not like a product purchased on my recommendation. I select affiliates who stand behind their products and offer a money back guarantee in the event you are dissatisfied with a purchase. If I have purchased the product, I let you know. If I haven't purchased the product, I let you know. If I haven't purchased the product but am interested in doing so, I let you know ... because I live on a budget and can't buy everything I want when I want. affiliate revenue from some products (not all) recommended or sold on this site. Please note that this site does NOT accept paid intext links. Please contact us if you are interested in advertising on this site. As previously stated, if you buy something by clicking on one of their text links on this site, I earn a commission. Please do support my affiliates and recommendations. This site takes time and effort to deliver original content, free, to you. Supporting my affiliates is a WIN-WIN-WIN for you, me, and them. Thank you very much. One final note ... although not an affiliate, between February 2011 and November 2011, I was employed part-time with the Institute of Professional Bookkeeper's of Canada in Member Services. P.S. No compensation was given for any visitor feedback on this site. If you choose to refuse Bookkeeping-Essentials.com's cookies, you may not be able to fully experience the interactive features of the site. Bookkeeping-Essentials.com may collect personally identifiable information from you in a variety of ways, including, but not limited to, when you visit our site, register on the site, or fill out a form, and in connection with other activities, services, features or resources we make available on our site. Bookkeeping-Essentials.com may use Facebook commenting in the future. Facebook stores all of your comments and may show them on your timeline, depending on your Facebook setting. 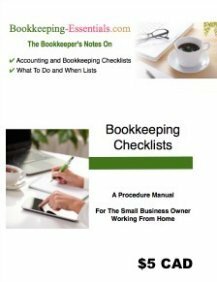 Bookkeeping-Essentials.com contains links to other websites that may be of interest to you. However, once you have used them to leave our site, we do not have any control over that other website. Therefore, we cannot be responsible for the protection and privacy of any information you provide while visiting such sites. These sites are not governed by this privacy statement. Always exercise caution by reviewing the privacy statement of the website in question before continuing to use it. If we sell Bookkeeping-Essentials.com, the information we have obtained from you through your voluntary participation in our site may transfer to the new owner as a part of the sale so that the service provided to you may continue. In that event, you will receive notice through our website of that change in control and practices, and we will make reasonable efforts to ensure that the purchaser honors any opt-out requests you might make. You can also request to edit, download or delete any of your information from the servers by clicking on that link when it becomes available. Reproduction of information found on Bookkeeping Essentials is not permitted without written permission. You are, however, welcome to link to any page from your website. If you are going to use the material on this to write your own original web page content, please site your source, acknowledge Bookkeeping-Essentials.com and proivde a link back to the article you used as your reference. You will notice throughout the site that we take the time to let readers know the source of "our knowledge". Do you think the content on your site would benefit my site visitors? We love high quality, relevant content. Contact us and let's see if we can work something out. 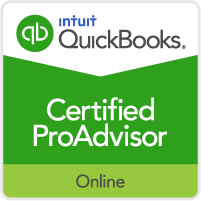 It is understood that references made on this website to QuickBooks, QuickBooks ProAdvisor and Certified QuickBooks ProAdvisor are registered trademarks and/or registered service marks of Intuit Inc.
Use of, or references to QuickBooks® software does NOT mean Lakeshore Bookkeeping Services or bookkeeping-essentials.com are “Officially Endorsed by”, “Authorized by”, or formally “Partnered” with Intuit, or that I am an employee or representative of Intuit ... in other words, Lakeshore Bookkeeping Services or bookkeeping-essentials.com are not agents or representatives of Intuit. Lakeshore Bookkeeping Services acknowledges that Intuit makes no claims on behalf of me or my company as to the quality of the products or services offered. Screen shots used throughout this website are used purely for educational or illustrative purposes. It is understood that these screen shots are the intellectual property of Intuit ... any commentary or other text analysis added is attributable to Lakeshore Bookkeeping Services, and not to Intuit. I attempt to gather the information for this site from, what I believe to be, reliable sources and my own experience. I welcome your comments with regards to correcting errors or omissions. Please be aware, I am not a certified accountant (CA, CGA, CMA) and am not engaged in nor provide review or audit services. The content on this site is intended for general information purposes only. Laws and regulations pertaining to tax and (to a lesser degree) accounting change frequently. It's important you understand that their application is dependent upon your specific circumstances. As I am Canadian and studied in Canada, what I present are Canadian practices. These practices may or may not be similar to your country's practices. As U.S. private small business bookkeeping practices are very similar to Canada's, and due to looking for answers for some of my customers regarding the U.S. and online purchases, I began including my research notes for the U.S. on the site. Please be aware that I do not perform bookkeeping for any U.S. clients. The content of this website is not intended to constitute legal, accounting, or tax advice; or opinions on any specific matters. Users of information provided on this website are responsible for the consequences and results of their own actions. You should not act or rely on this information without engaging professional advice prior to using this site content for any reason whatsoever. Also, to ensure compliance with United States IRS Circular 230 Disclosure requirements, please note that any U.S. tax information contained in this website is not intended or written to be used, and cannot be used, for the purpose of avoiding penalties that may be imposed under United States federal, state or local tax law. This site is operated by L. Kenway dba Lakeshore Bookkeeping Services. By using this site, you understand that L. Kenway dba Lakeshore Bookkeeping Services assumes no liability or responsibility for the accuracy or your use of the website contents or any links to third parties. I have made every attempt to state ownership of copyrighted material contained on this website. However, if I have erred or omitted, I would certainly welcome any information to correct my references. Please note that referencing or partial reproductions of copyright works does not infer an affiliation with the third party or that it is endorsed by the third party.